The Wright brothers, Orville (August 19, 1871 - January 30, 1948) and Wilbur (April 16, 1867 - May 30, 1912), were two Americans who are generally credited with inventing and building the world's first successful airplane and making the first controlled, powered and sustained heavier-than-air human flight, on December 17, 1903. 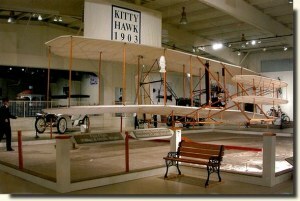 In the two years afterward, the brothers developed their flying machine into the first practical fixed-wing aircraft. Although not the first to build and fly experimental aircraft, the Wright brothers were the first to invent aircraft controls that made fixed-wing powered flight possible [wikipedia].